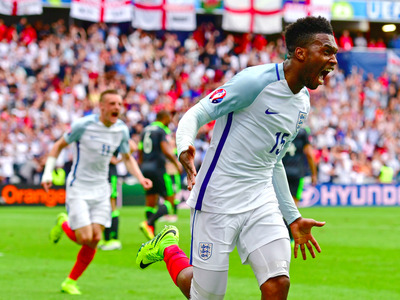 Dan Mullan / Getty ImagesEngland’s Daniel Sturridge celebrates his late winner against Wales on Thursday. The result of Monday’s football match between England and Slovakia could have a major impact on the EU referendum vote, a poll conducted by BMG for the Evening Standard suggests. BMG, which interviewed 1,466 UK adults online between June 10 to 15, says that nearly one in six respondents to the survey claimed they would be more likely to vote “Out” if England beats Slovakia. Meanwhile 11% of those asked said England progressing in Euro 2016 would make them more likely to vote Remain. The majority of those susceptible to the influence of football said a good England run would strengthen whichever side of the Brexit argument they were on. Despite their feelings on Brexit, 63% of respondents said England manager Roy Hodgson should keep his job even if the team did badly from here on out. At this point England would be unlucky not to make it to the knockout stages. The team needs to merely draw with Slovakia to guarantee a place in the last-16, but even if England loses it could still go through as one of the four best third-placed teams.